The astounding Geghard monastery is situated 6 km from the temple at Garni and is revered throughout Armenia as one of the countrys greatest spiritual and cultural centers. First called Ayrivank, or the Monastery of the Caves, the history of Geghard dates back to pre-Christian times. 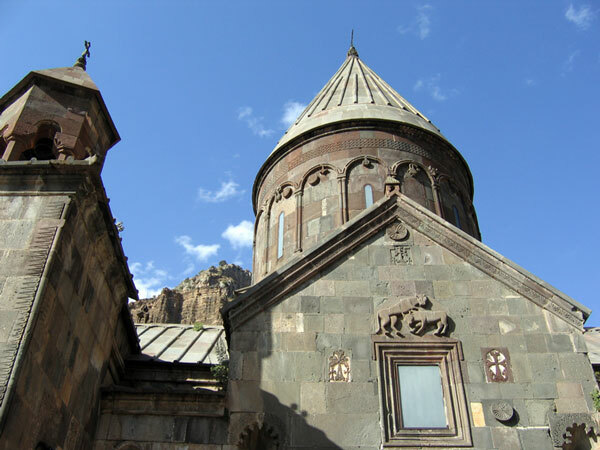 The present buildings here date back the 10th-13th centuries, when the monastery was renamed Geghard, meaning «spear» or «lance» in Armenian. The association itself harkens back to the times of Jesus, when a spear was used by a Roman soldier to pierce the body of Christ during the Crucifixion. The spear was long housed at Geghard, but is now in the museum of Ejmiatsin Cathedral. 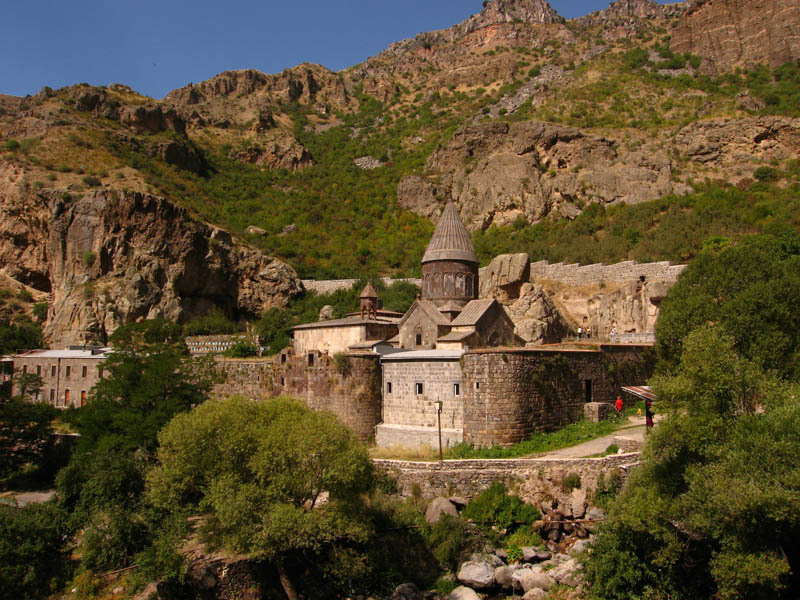 Geghard is an architectural wonder – a complex of churches hewn from within a mountain of solid rock. The most ancient cave-church of St Gregory (7th century) is outside the monastery walls. The principal structure, the church of the Virgin, is a cruciform building from the second quarter of the 13th century. It has a four-column gavit (1225) to the west of the church. Two cave-churches were constructed in 1263, along with the family sepulchre of the Proshian Princes. Their coat of arms is carved in the rock: two chained lions and an eagle with half-spread wings, whose claws grasp a calf. While in Geghard, notice tied ribbons on the tries around the river and sacrifice rocks with blood passages. The tied ribbons represent whishes and sacrifice rocks are used when someone brings sheep or chicken to sacrifice. These traditions are not Christian, they date back in ancient times when Armenians were influenced by the Persians and their Zoroastrian religion. There are two preserves near Garni and Geghard. Erebuni preserve is situated between Shorbulach and Geghadir villages. It is home of the ancient wheat of Erebuni. Famous academician Vavilow in 1934 visited Armenia and was impressed by the areas richness of ancient wheat specimens. The significance of the Erebuni preserve to the world and agriculture is invaluable. Khosrov preserve is one of the oldest preserves known in history, king Khosrov III created the preserve around 330 AD and for 17 centuries it remained untouched. Together with other domes and columned belfries, the Geghard complex is deservedly one of the most popular destinations for the locals and tourists alike. Boasting intricate stone-carvings, a natural spring, and numerous «stone crosses» (khach-kars), Geghard has endured all manner of assaults throughout the past 700 years.